The stereotypical picture of marijuana consumption is someone toking up buds in a joint or bong, but as weed comes out from the shadows and into the legal marketplace, entrepreneurs are busily concocting all sorts of pot products. From vape pens to concentrates to edibles, drinks, tinctures, and even creams and topical lotions, marijuana is now available in myriad forms. But what's the most popular? Here, we turn to the good folks at BDS Analytics, a company that prides itself on providing "data-driven insights, market intelligence, and complete consumer understanding" of the marijuana industry. BDS has just released its list of the Top 10 ways people are consuming cannabis in 2018, based on results from its proprietary GreenEdge™ Retail Sales Tracking database, which gathered data from California, Colorado, and Oregon from the first half of the year. The biggest takeaway is that despite all the hoopla about the multitude of new marijuana products, people still overwhelmingly favor inhaling their weed, either as smoke from buds or via vaping. Sales of buds, pre-rolled joints, vape cartridges, and disposable vapes accounted for around $1.8 billion in sales, with another $200 million coming in sales of concentrates, which are typically also inhaled. And it was buds (flowers) that made up more than half of that figure. Edible and tincture products that made it into the Top 10 only accounted for about $200 million in sales, or about 10 percent of the total pot market in those three states. While edibles and other cannabis concoctions may be the wave of the future, as of now, bud is still the king. 1. Flower: This shouldn't be a surprise to anyone. We all had joints, bowls and bongs long before we could easily buy weed-infused kombuchas. Good old flower was there first, and it remains on top. Sales: $1.1 billion. 2. Vape cartridges: This category only looks at vapes and vape-accessories that come with cannabis and are sold in dispensaries -- not the pot-free vaporizers you can buy online. And they are extremely popular -- rising all the way to No. 2 in our list. Sales: $476 million. 3. 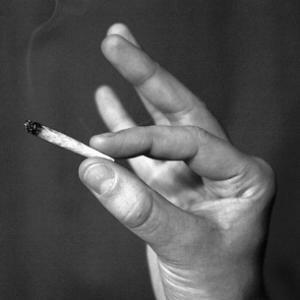 Pre-rolled joints: Forms of inhalation claim all of the top 3 ways people take their weed. Pre-rolls include plain flower, and those that are "infused" with concentrates. To keep things simple, we just looked at the broad joint category, including infused. Sales: $185.5 million. 4. Gummies: People who like eating their ganja are especially fond of the sweet and sour and chewy treats. Way to represent, gummies! Sales: $135 million. 5. Dropper: Bet you didn't guess droppers would round-out the top 5, did you? Not long ago, they didn't. But droppers' popularity has been spiking for several years, and now they represent one of the most popular forms of cannabis consumption: fill the dropper with a dose, squirt it into your mouth, and savor the flavors, which often involve things like tropical fruits and berries (along with cannabis). Sales: $68 million. 6. Shatter: This stiff, glass-like form of concentrate, which often gets inhaled after it is heated on a dab rig, was a popular form of concentrate from the beginning -- in fact, when Colorado first began legal adult-use sales in 2014 it was the second-most popular kind of concentrate in the state for the year, behind wax. Back then, vape was a minor category. But now, shatter is second only to vape in the concentrates race to supremacy. Sales: $64 million. 7. Wax: It's a bit of a sibling rivalry, the jockeying for second place that takes place between shatter and wax, which is pliable compared to stiff shatter. The two routinely trade the No. 2 spot, among concentrates. Sales: $63 million. 8. Live Resin: … Sales: $61 million. 9. Disposable vapes: As we know, vape pens are extraordinarily popular with cannabis consumers, and most people buy cartridges (No. 2 on this list) which they fit into their pens when the previous cartridge's oil is all gone. But some vape pens come pre-filled with cannabis oil, and are tossed when the oil runs out -- no option for just plugging a new cartridge of oil into the pen. Sales: $56 million. Rounding-out the Top 10 we have another edible. Chocolate bars were the No. 1 way of eating weed back when adult-use sales were first made legal; in Colorado, during 2014, chocolate bars grabbed 20 percent of the edibles market, compared to 17 percent for gummies. But trends have changed dramatically. Still, chocolate squeaked into the Top 10. Sweet! Sales: $39 million.